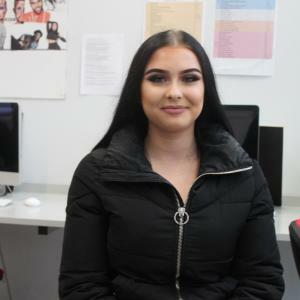 Emily joined East Surrey College after taking a year out from studying at Reigate College - she had heard great things from friends at ESC about the facilities and teaching and enrolled on Art & Design Level 3. "I was really impressed - it has everything I need!" Now currently in her second year of the Photography HND, Emily enjoys being able to further her knowledge of digital and darkroom photography, and benefits from the creative freedom offered to students on the course - "I love the briefs - you're able to interpret it in your own way and work independently." As Emily is in College 2-3 days a week, she is able to dedicate time to her other passion: make-up. Emily's work as a freelance and completely self-taught make-up artist has led her to work with celebrities at events such as the National Television Awards and London Fashion Week, in her collaborative work with a local hairdresser and a celebrity stylist. In the long term, Emily is hoping to combine her love of photography and make-up to set up her own freelance make-up and photography studio, building on her impressive portfolio of College and external projects. "I love the experience and atmosphere at these events - all my years in education are paying off!"